This week in Cleveland, Mayor Frank G. Jackson congratulated and presented certificates of recognition to the Whitney Young High School artists, Eaon March, Chae Simpson, Maria Cuandra and their teacher, Linda Zmina. 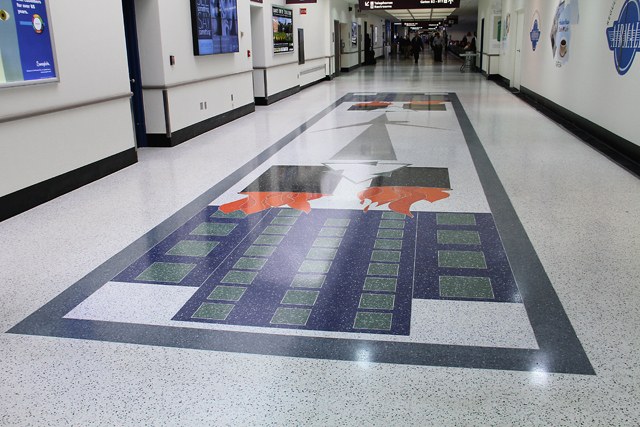 The students’ artwork, “A Green City on a Blue Lake” was chosen from many entries and installed as part of the Airport Terrazzo Floor Art Project. Mayor Jackson and Director of Airports Ricky Smith gave brief remarks at the unveiling of the fifth Terrazzo art piece installation held at the Cleveland Hopkins International Airport (CLE). Visitors to the airport will be able to see this artwork at concourse B, gate B-6.